Is it really Monday again? Sigh. My weekend started off with a great 4 mile run – yes, I ran 4 miles! I’ve only ever done that once before, so I was on a runner’s high for a while after :). 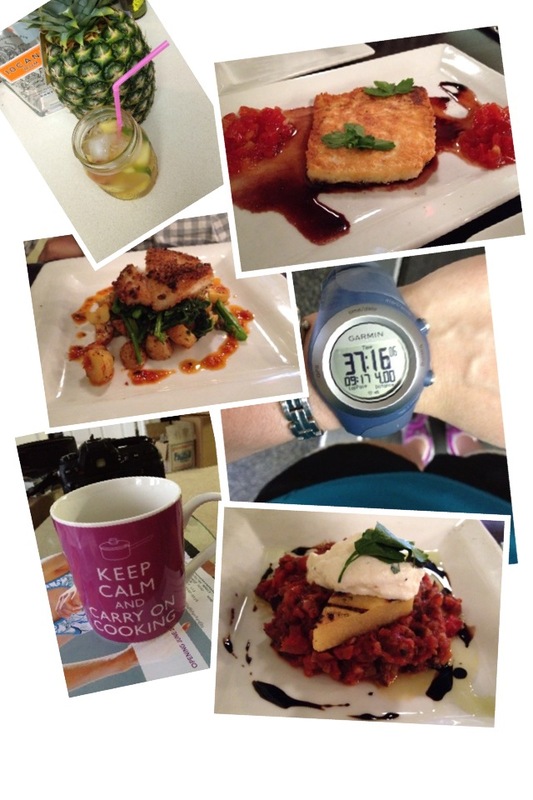 I also enjoyed some delicious sangria and great food, and found a cute coffee mug at TJMaxx. The other exciting part of my weekend was taking a yoga class! I decided to join in on Courtney’s June Yoga Challenge. I’ve tried yoga a couple times before, but have never really gotten into it. I enjoyed yesterday’s class, though it was a little slow paced for me (it was the “gentle” class). I’m going to try a Hatha class and a Flow class this week too and see what I like best. Hopefully, I will enjoy it and decide to buy a 10 class pass. Luke and I happen to be moving to a house that is a two minute walk from the yoga studio, so it would be quite convenient to get my yoga on! Moving on to a much anticipated recipe! Let me start by saying that I am not a big fish person. Over the past couple of years, I have gradually, and I mean very gradually, come to like a few fish. My favorite fish is seared tuna, but only if it has a good sauce. Usually, when I’m trying a new fish, I ask if it’s a “fishy” fish, and if it is, I won’t try it! Salmon has always been a fish that I consider too “fishy”. I’ve tried it numerous times and not liked it. The reason I keep trying it is solely because it seems to be most people’s favorite fish and I really want to like it. Low and behold, last week’s Asian Marinated Salmon finally made me a convert! I don’t know how to describe it other than extremely delicious and tasty. 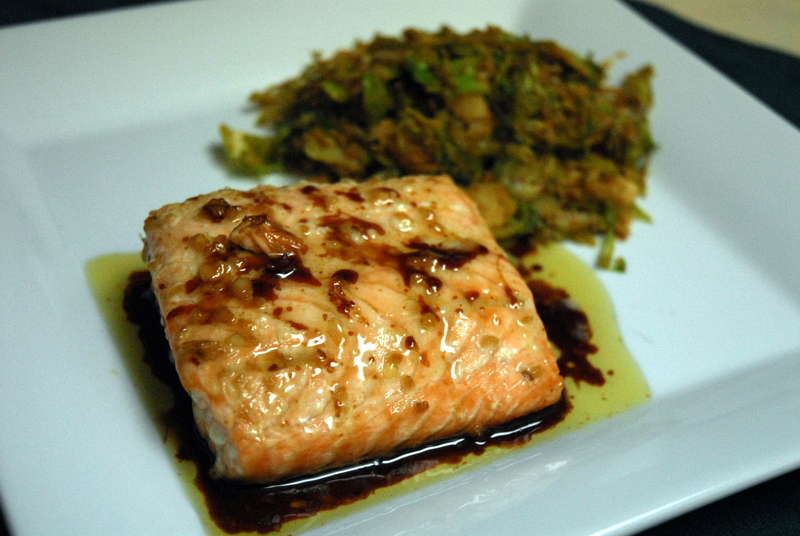 Getting me to like salmon has been no small feat, so you can imagine how good this must be! And it’s oh so simple! Just place the salmon in a baking dish and make a few incisions, then stir together all of the other ingredients in a small bowl. 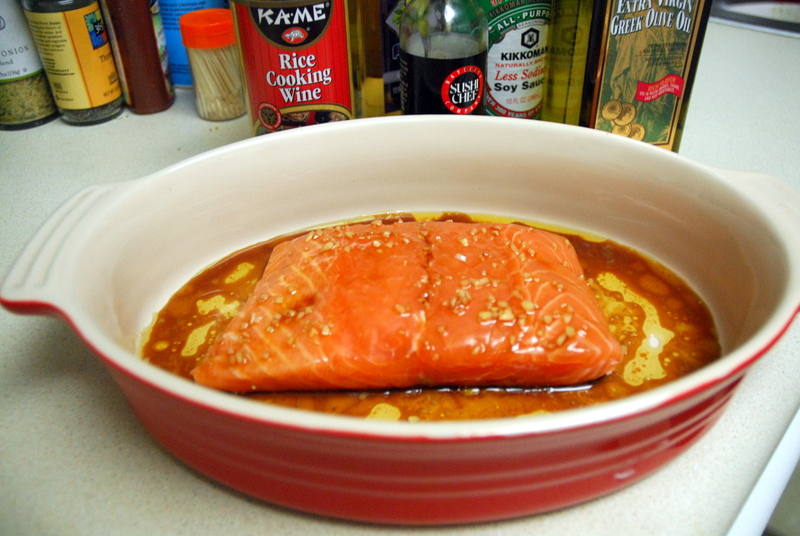 Pour the marinade over the salmon, cover and refrigerate for one hour. Then bake it at 350 for 25 minutes and you’re done! Place the salmon in a baking dish and make a few small small incisions to allow the marinade to penetrate the fish better. In small bowl, mix all of the other ingredients together. 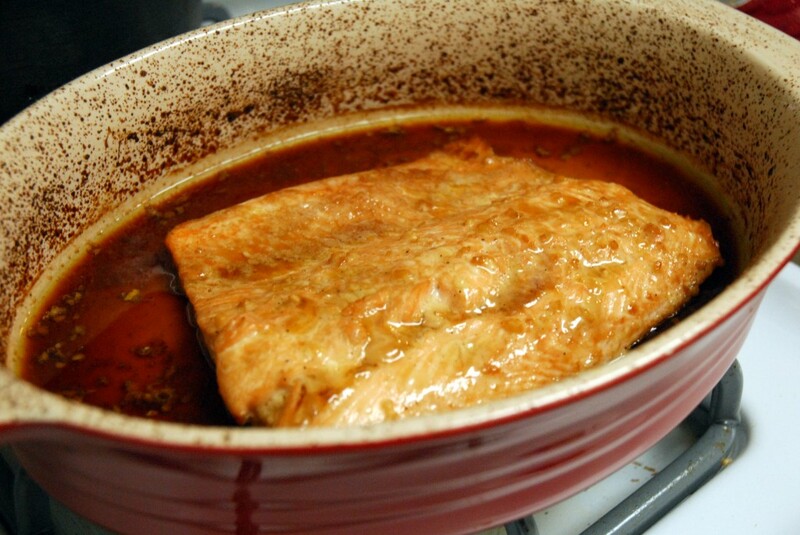 Cover and refrigerate the salmon in the marinade for one hour. 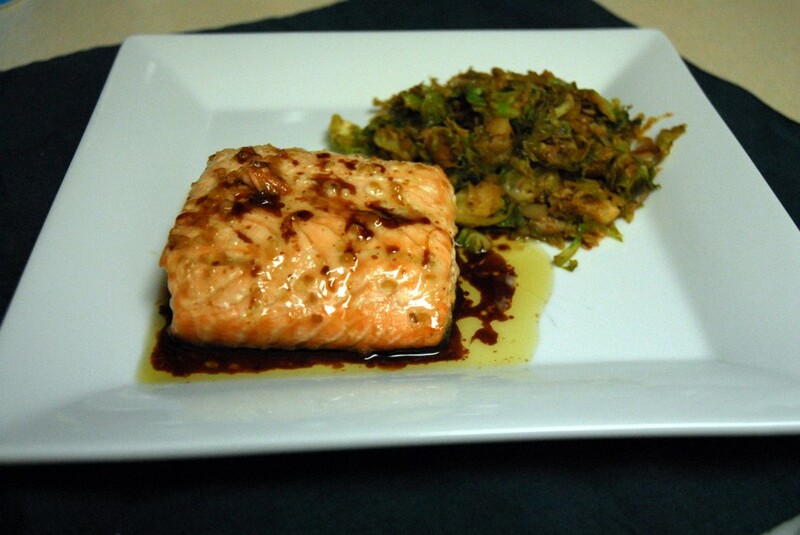 When ready to cook, preheat your oven to 350 and bake the salmon at 350 for about 25 minutes. Serve with extra sauce and enjoy! This entry was posted in Asian, Fish, Gluten-free, Recipes, Running, Vegetarian, Yoga and tagged asian, fish, gluten-free, running, salmon, vegetarian, yoga. Bookmark the permalink. Wow, great run…speedy too! Four miles is a really tough distance – it’s not exactly short enough to blast through but it’s not really long enough to settle into a steady rhythm with. Way to rock it out! thank you so much for that recipe 😀 you best believe I bookmarked it! heck yes for 4 miles – thats awesome girl! Your welcome – hope you like it! 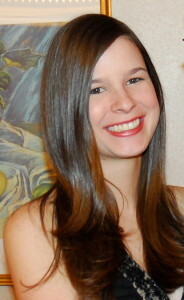 I’m thinking I might like the Flow classes better – I’m hopefully taking one later this week, so we’ll see!